Start-Up Communities (SUC) is a broad EU wide partnership project designed to identify core and innovative learning and delivery components of a service/programme/community that best encourages, inspires, supports and enables successful start-ups and entrepreneurs through life-long learning relevant and desirable for employability, enterprise and collaboration. Our project will research these components, each under the guidance of an expert, throughout our partner countries finding best practice, case studies, lessons learnt and future opportunities. We will then design a simple Start-Up Community model based on our findings to guide new SUC across the EU. SUC is an environment in which entrepreneurship is supported and promoted by a team of key actors playing vital roles as training providers, inspirational models, mentors, possible investors, network facilitators and other feeders. All within the community are connected and all relationships are cooperative based and mutually beneficial in the long-term. In this environment, to foster entrepreneurship, in particular among young people, a number of learning/teaching/training processes happen and models/tools are applied. Entrepreneurship education and the start-up era is happening all around Europe at different speeds and in different ways. There is a wealth of best practice, experience and innovation spread across the EU but not shared. The project will search and highlight best practices emerging on entrepreneurship education (formal, informal, virtual, creative), make European wide research and comparison and create a useable guideline. Europe needs more enterprises. For over a decade the EC has been championing measures to create a more business-friendly environment to promote economic growth and jobs through the creation of start-ups and young entrepreneurship. In the Europe2020 perspective, entrepreneurship is a pillar and the enhancement and development of an entrepreneurial spirit among European citizens is considered a priority to deliver smart, sustainable and inclusive growth. "How can we make our community a favourable field for new companies and youth entrepreneurialism, promoting a sense of initiative among all our citizens?" The project has a simple scheme that will guide its development during the two years. 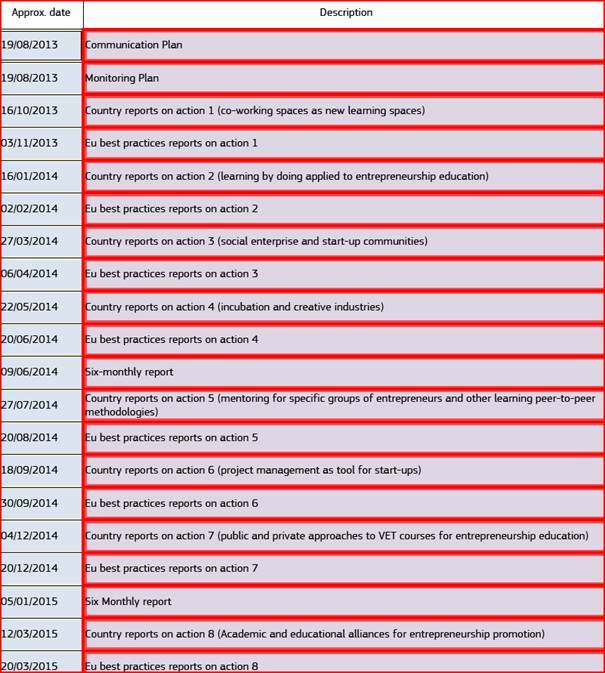 In this scheme all partners contribute to project actions and objectives according to their specific competences, field of intervention in the wider topic of "entrepreneurship education" and "start-up communities". 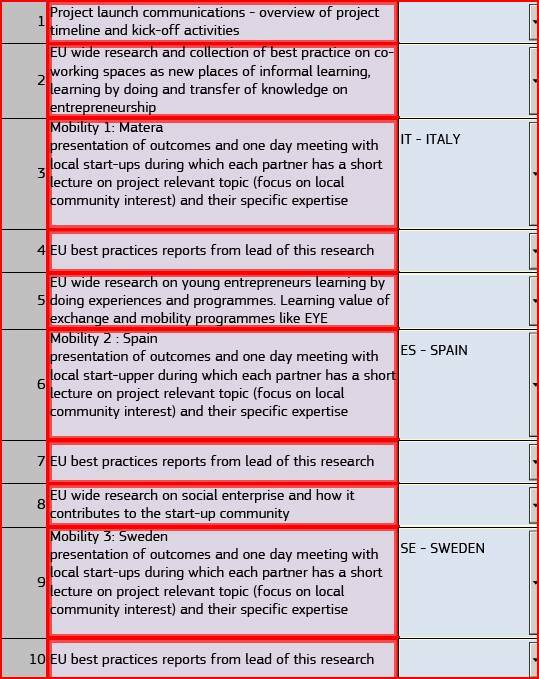 Each partner will be involved in a national research for best practices on the project mobilities topic (9 topic). Each mobility will be focused on one of the project topic. The partner organising and hosting the mobility has experience on the topic of the meeting. It will lead the research collecting contributions from partners. - lectures for local target groups (young entrepreneurs, startup, other business operators) from partners according to their specific expertise and the local interest, needs, requests. 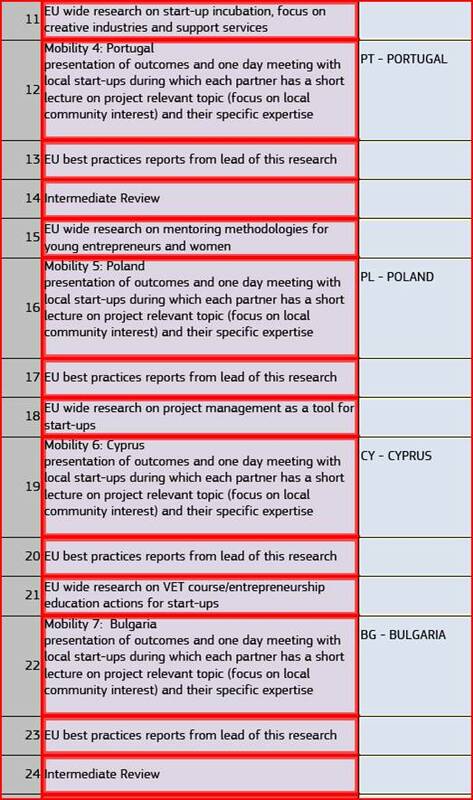 At the end of the mobility the partner in charge of the research (the one hosting the linked mobility) will develop a European report on best practices detected in the specific topic. These reports will form a large part of the final document collecting best practices for the model of startup communities. In addition to this, each partner will be in charge of country dissemination, of contents for the project blog coming from its sector of activity and of other project management actions as planned according to the monitoring plan. The strength of the project development and delivery will be assured by a constant involvement of all partners in decision making and through a constant activity of communication, agenda setting and reporting. Each partner by approving the final draft of the proposal accepted its own tasks and responsibilities and was completely involved in the design and scoping of the project. The high number of partners required a clear indication of what each organization could provide by implementing the proposal, and achieve following it. Apart from common tasks that will be implemented at national level, similar for all partners, such as internal financial management, communication with stakeholders, research and analysis at local level, the management of the project will be organized through a Lead Partner, responsible for the whole partnership, and other partners appointed for specific tasks such as project dissemination at European level, document library creation and updating, project reporting. Communication has a fundamental role in the creation of the cooperative environment as all partners, apart from the meeting possibilities provided by mobility, will have to be constantly in touch for the development of the project through all the possible new means of communication. Each partner will provide a contact responsible for communicating on a daily basis with project partners. Communication will happen through virtual conferences, instant messaging utilities, email, phone call, file sharing, social networks (a facebook page and a twitter account) and all other possible means to make it direct, instant and effective and make the ideas and information available to all immediately. A project blog will be created with all partners contributing to its update, sharing relevant information and news on project topics of interest for target groups. Partners will be invited to discuss main issues of the project and provide opinion and feedback on shared activities. Moreover each partner in the "national phase" will be asked to inform other actors in order to start comparison and highlight possible problems emerging during the implementation of actions. Each partner will also manage their communications with partners in their own country to actively engage, listen to and feedback to. Each partner will propose the best way to communicate partnership actions, results, studies to local actors and stakeholders to make dissemination profitable. The project is clearly focused on entrepreneurship support and KC7 as a general topic. Given this, partners staff will be the first beneficiaries of the whole structure of the project as by performing specific analysis and best practices research they will be able to increase their knowledge on other fields of the same sector, understanding other training methodologies and learning approaches on a common topics (support for entrepreneurs/start-ups). Their overall skills and competences will grow as the project develops and as the contributions from all other partners are provided. Relevant staff of all partners are already active in the project application development, providing input, how to shape actions and all agreed on the needs and relevance of the project for their own context. This improves the impact of our project due to the breadth of experience housed in our partnership. Their involvement in the development of activities is clear: each partner and so each professional of the staff will take care of research activities (both as lead of a specific action/topic and as partner in other analysis leaded by other partner), furthermore during each mobility the partnership will have conference/seminar/lectures open to the target groups of local entrepreneurs start-up and so each professional will be also involved as trainer/coach/lecturer on his/her specific information. Each organization will select the best professional profile to deal with the two activities. Staff not directly involved with the project will be invited to attend mobilities when they are hosting creating a collaborative atmosphere and raising awareness of the project and its outcomes within every partner country. As for the monitoring of the project, each organization will nominate a monitoring antenna to deal with the Quality Plan developed by materahub. Same will happen for project dissemination at local and European level in networks of other actors interested on the topic. The project takes advantage of partners’ everyday activities with start-up and business support. Each partner will easily integrate project results and studies into own activities by improving some services, developing new ones, deepening the impact of local actions with a more European vision. The idea is for each partner to be able to implement and support the rise of a start-up community exploiting project results to involve local actors that could cope on the challenge to reproduce all the best practices detected at EU level by shaping them according to local needs and specific characteristics. SUC is complementary to other EU initiatives such as Erasmus, which many partners are involved in. Materahub: together with other local actor the hub is trying to create a community of people willing to become entrepreneurs and to risk to sustain the economic development of the area. It is also managing programme like Erasmus for Young Entrepreneurs and other entrepreneurship education programme that find place in this project. Mentortec acts as a business angel and provides incubator services with the objective of promoting the creation of new technology-based SME. The services provided by the company are related to the full life cycle of the creation of start-ups/spin-offs to their successful functionality. In order to complement this activity, MentorTec wants to improve its skills by incorporating the concept of Start-Up Communities (SUC), enlarging its network of contacts to create its own entrepreneurial environment (including different agents such as training providers, inspirational models, mentors, possible investors, network facilitators and other feeders) and implement new collaborative models that will enable and foster entrepreneurship in particular among young people. Amery Brothers: is building support for young aspirant entrepreneurs and through SUC can learn new functional activities to help young people take the big step needed. Fox-Populi: it is using and developing non-formal educational games to stimulate and boost both creativity and entrepreneurship for young adults and this is an integral part of the value chain to support start-up communities. This service could benefit from the overall project approach. DBO: One of the action fields of DBO is ‘stimulating entrepreneurial behavior of young people and promoting entrepreneurship in education. For many years, DBO is running al kind of projects on this topic. The partnership foresees a specific activity of monitoring and evaluation of the project, its aims and of the objectives achieved. The monitoring of the project during its implementation will be assured by a delivery monitoring plan, composed of tools tailored on specific aspects the partnership wants to evaluate qualitatively and quantitatively. The plan will evaluate timing of action, quality of cooperation and communication among partners (also effectiveness of instruments used), quality and quantity answer of products and outputs to what has been previewed in the proposal, the capacity of the project to involve other actors and stakeholders, providing the right instruments and solutions to intervene during the project implementation and modify wrong aspects. Moreover the project will be subject to the evaluation of local participants involved in the local events (to validate the model created and the approach), the partnership will ask for feedback on how the project met their expectations and needs, to better understand the direction of the process and how it can be improved moving forward. Finally the results of the project will be evaluated by all the organisations involved in order to promote them for further community initiatives in the same programme or to be further perfect or better fit to specific local needs. Our ongoing monitoring and evaluation framework will run in overlapping cycles to allow the results of the evaluation to have a beneficial impact on the partnership and its work, but also to strengthen the value of working in collaboration and informing future activities. materahub will take responsibility for monitoring and evaluation of the participants and the partnership, as well as the reporting of it to all other partners so we may all use it to evolve our partnership towards a common vision, it will provide an evolved and well rounded monitoring platform. We will employ group discussions, graduated feedback forms, free text feedback, written comment on document production and iterative editing within a pre-described evaluation framework identifying actions, their owners and their deadlines. We will have periodic questionnaires for all partners focusing on individual expectations, project development, project issues, task assignments, opinions about coordinator’s support, attainment of fixed goals etc. This framework and its content will be visible to all partners to promote its position as a living and useful process. A dissemination activity is foreseen from the very beginning of the project development, in order to grant the highest visibility, spread activities, products and results both at National and at European level with the objective to involve and make active stakeholders, actors and all the categories that might be interested in the results of the project (young entrepreneurs, business associations, VET system organizations and institutions). 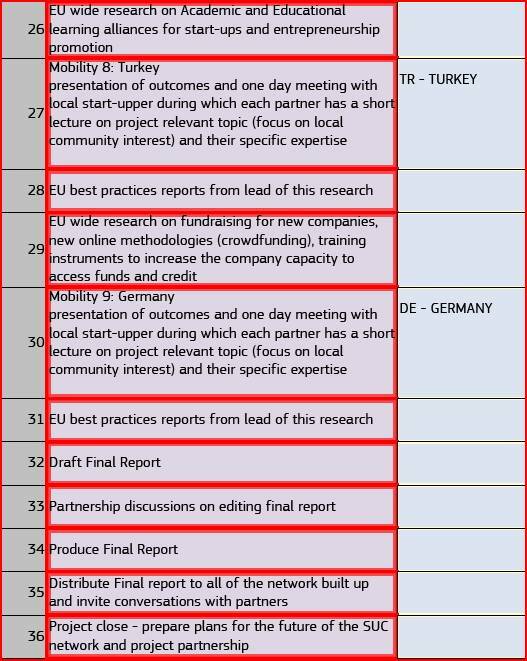 Dissemination will be performed at two levels: national dissemination by each partner in its national/local framework; European/International dissemination realised by the partnership in a wider context to reach other countries not involved, European Institutions working on the specific field, other relevant actors. Participating organisations can be considered operators of the "educational world", therefore they will be first able to use the results of the project in order to increase quality of educational offer provided, becoming more able to answer to market demand of specific and quality competences and target groups demand for an effective and valuable training. Each organisation at the end of the project will benefit from the experiences shared by the partnership and will become a member of a network of organizations working to further improve the results obtained, making them more adaptable to other contexts. Local communities, as well as the "lifelong learning" community will be reached by a concrete dissemination activity based on specific actions the partnership will perform. Results, experiences and final products will be disseminated through: conferences and workshops during the project life through meetings with the involvement of local stakeholders (private and public) to build project scope and achievements and to improve project strategy in accordance to the broad community feedback on project progress; media including newspapers, specialized magazines, radio and social media all as instruments to promote and spread information on how the partnership is working and which direction the project is following; Internet, including a blog with information and materials available (project logo, periodical newsletters, press release) translated in each partner language, in order to give further diffusion. We will produce specific materials for dissemination beyond our reports including e-newsletters, e-flyers and e-posters.